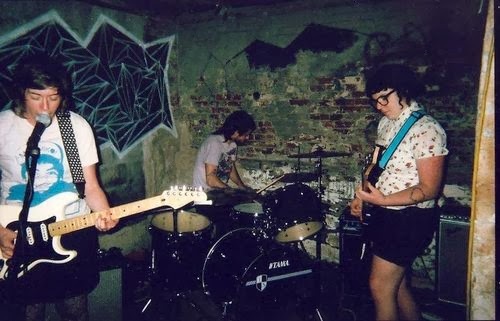 We talked with Parasol about their first show, DIY spaces, and diva cups. I recently attended a show where myself and the female members of a band experienced sexist verbal harassment. While this is obviously not okay on the most basic levels of respect, it was extremely disheartening to hear other female musicians say, "We're used to it." No one should ever have to deal with assholes who don't understand that objectification is in unacceptable and it should not be a norm! However, bands have the power to encourage attitudes of positivity and safety, and that is exactly what drew me to Parasol. Self-described as "anarcho-pop," Boston's Parasol strongly believes in DIY. They prefer to play all-ages spaces, and recently performed at Ladyfest Philly. Their gritty guitar driven tracks retain encouraging attitudes of empowerment and consent. Parasol's most recent album, Not There, explores the overwhelming and confusing place many young people find themselves in as they find their own independence. I spoke with Vicky, Lily, and Jake following their recent East Coast tour about their first show experience, the importance of DIY spaces, and selling diva cups as merch. TLS: How did Parasol form? What was your first show like? Vicky: Parasol formed after Lily and I met in Florida, where I saw her play in her old band, Inertia. We recognized each other from both living in Boston, and exchanged contact info. Back in Boston, she started coming over to me and Jake's house to hang out and play music in our basement, and I guess that's when the band formed! Our first show was in Western Massachusetts at the Flywheel with Bad Banana and Sourpatch. It was terrifying and kind of awkward, but really memorable. Lily: Yeah, I will never forget the day Vicky walked up to me on the street and asked me if I was from Boston. It almost felt like she was the first friend I met in Boston, and it was so weird that I was meeting her in Florida of all places! Playing music with Vicky and Jake, and now also Josh on second guitar, has grown in a really nice, organic way. Meghan Minor, who rules, booked that show, and who I look up to a lot so it was really exciting to play. TLS: Where does the name Parasol come from? L: We had the hardest time naming this band for some reason! An ex of mine was like, "I have always wanted to name a pop-punk/dream-pop band Parasol," and we stole it and it stuck. Band names and naming songs are a really strange hard thing for me to nail down personally. I know other musicians like that too. I wonder why that is? Half of our song names are jokes made up on the spot. Jake: All of our songs have like five different names relating to different jokes at different practices. No one knows their real names, not even Lily. We need to refer to the records. TLS: DIY spaces seem to be entering a new area of discussion and debate with the closing of 285 Kent. Why do you think DIY spaces are important and how have they affected Parasol? L: When I was in my late teens and early 20s, I was fortunate enough to have spent a lot of time in NewYork. I remember being amazed the first time I entered certain spaces in the city. Spaces like 285 Kent, The Feminista Loft, 538 Johnson, etc. were really important to me, even though I didn't get to actually live in New York for very long. They just showed me what could be possible in such a huge, seemingly disconnected city scene. That, combined with the years spent volunteering and booking at the DIY venue in my hometown of Tampa, FL, have made DIY spaces something I personally hold very near and dear to my heart. I played my first show in a house and then at Transitions Art Gallery in Tampa. Backyards, garages, living rooms all defined my 'coming out' years as a musician. The community and support I both gave and received was really important to me. It kills me to think about kids who might never get access to that, who might never get to experience venues or shows outside of bar settings, because it is considered "illegal." As a band, I feel that we have all had some sort of similar "magical" experience in walking into or discovering DIY punk, and suddenly feeling less alone or alienated. No matter how fleeting that moment might have been before we also were able to criticize it, or before it also showed its own set of problems to us. I think we all know that moment is really important to experience as a youth. In Boston, we are having similar conversations after a semi-recent (and what felt like complete) shut-down of some pretty crucial all-ages spaces that were doing shows. The ebb and flow of DIY spots here is so hard to deal with in our city. Lately, we can only have shows at bars (where usually a large percentage of the door money for bands has to go to the bar) or in what appears to be a top secret location. The reputation of Brooklyn being "hard to play" is not unwarranted. That being said, everyone that tries to book here, tries really hard to make things happen and the fact that they happen at all is really amazing when you think about it. V: I think that DIY spaces have always been coming and going. The ebb and flow changes the scene around the them, making room for new people to step up and share their basement or figure out a new place to host shows. They are important because anyone can be involved, regardless of age or experience. Everyone in Parasol prefers to play, book, and attend shows in DIY spaces – it's part of the fun of being in a band for us. TLS: What does it mean to be a non-dude in a pit of mostly dudes? V: For me, it means being hyper-aware of the people around me, and feeling on-guard all of the time. Luckily, Parasol hardly plays shows where Lily or I are the only non-cis-dudes. L: I think about why that is a lot. The fact that most cis-dudes at shows don't have to think about their gender in the same way that we do, if at all. I just had this conversation with my friend Aimee about how when we are the only women at a show, or on tour, or wherever, we sort of negotiate ahead of time how we are going to present ourselves and what role was want to take as a 'woman' in those settings. It isn't all the time, but I often wonder, why can't be ourselves? What is it to be 'the self' as a woman, and what does it take to feel that way? The need or urge to take on certain roles or play into archetypes (little sister/overbearing/motherly) so we do not get prayed upon or seem available is something I have talked about. Perhaps cis-men negotiate their identity in other ways, but I feel that this experience, of negotiating to compensate for your gender presentation, is very specific to those who are not in positions of social power or are often afraid to show their true identity in certain settings. TLS: Many of your lyrics are about escaping and overcoming physical and mental oppression. What advice can you give about leaving unhealthy relationships? L: Something I'm working on now, even years after being in intimate relationships with abusive, really toxic people, is recognizing when I'm starting to lose myself to a relationship. I'm learning to acknowledge when I start to hide my emotions or feel up against other powers that seem outside of my control in a relationship early on. Realizing that you have let go of yourself or that someone has manipulated you into feeling like you aren't worth anything is so hard to recover from. When I start to stop expressing my needs or desires in a relationship – when I stop doing things that I want to do or stop talking to people I really like, I ask myself why that is. What dynamics are emerging in my life that have caused me to stop taking care of myself or the people around me? I think that recognizing that regaining a sense of self, drive, and purpose to live and love and being excited about life for yourself, is a really big part of the healing process for me. Using myself as a guide has helped me make better choices in my romantic life and break some cycles of abuse that I am vulnerable to. TLS: Your song "No Where To Go" includes the lyric "We laugh at talks of our futures / Because they don't look bright / We barely have the stars at night to guide us home / and nowhere to go." This feels depressingly relatable as a young adult. Could you explain your relationship with these lyrics? L: I was thinking about the phrase "You have your whole life ahead of you" and how laughable that can seem when you are feeling completely uninspired by what your future is supposed to look like. We are supposed to be guided by hyper-materialist, ultra-capitalist standards that do not bring us any real happiness. So many people around my age in their mid-twenties (and under or over) feel really aimless right now and are scared of what our world will look like 10,15, and 20 years from now. We have "nowhere to go" in a sense that there is no "up from here" which is what is prescribed in our culture as the thing we should care about most. We have been labeled the 'Millennial' by liberal media. We want to do so much, change so many things, but feel up against huge barriers environmentally, economically – war is everywhere. Even the simplest things in life like the stars in the sky are becoming harder to see as we all move and migrate into cities because that is here jobs are. What are we guided by anymore? Our friend Chris Lee wrote a piece on Millennials and Apathy that I really related to that you can find here. TLS: What are (if there are any) some stereotypes you have encountered as females in the punk scene? V: The first that comes to mind with me is that "girls make cute music." L: Yeah, also like that women can't set up gear or know their way around the more technical aspects of musical equipment. The stuff is so mystified and held like a secret language from people. TLS: If you had to form a snack trifecta where each band member represents a certain snack, who would be what? L: Josh would be Fritos, Vicky would be some sort of citrus, Jake would be trail mix, and maybe I would be a Larabar. I just name the things we bought the most of on our last tour, but WHATEVER. WE LOVE SNACKS SO MUCH. J: Why trail mix? People are gonna think I'm a hippie. Fun fact: the Wikipedia page for "snack food" is the funniest thing in the world. We read it out loud in the van. L: Dude, I dunno! You're a mixed bag of awesome. You are like all the best things in one! You can be a different snack. TLS: You've already sold pencils that say "Destroy Patriarchy." What would be your dream merch? L: I second the diva cup idea. Also, maybe screen printed undies. J: Oh I dunno, maybe like a ready-made hex that you could use on your enemies. Parasol hex. I don't know. Parasol tarot cards? TLS: Finally, any recommendations for female-fronted punk bands that support similar ideologies as Parasol? L: Curmudgeon, Peeple Watchin', Tomboy, Shady Hawkins, HIRS, Permanent Ruin. Basically any band playing Boston's Smash It Dead Fest in March, female or not is rad and we love them! Listen to Parasol on bandcamp.